A large technology company was getting feedback from buyers through its Win Loss program: the price is too high. The company used the program to gather more information about how buyers were thinking about price and what the competition was doing. Through the Win Loss program's buyer interviews, seller discussions, and executive team meetings, the company discovered the cloud solution wasn't aligning with buyer needs when they had non-mission critical applications. To solve the issue, the product team introduced six new configuration models, resulting in a solution that was easier to sell, easier to buy, and produced a two-year competitive advantage, according to Gartner. Jim, the Vice President of Cloud Computing for a large technology company, kept hearing the same thing: your price is too high. The feedback wasn’t uncommon, but this time it was different. 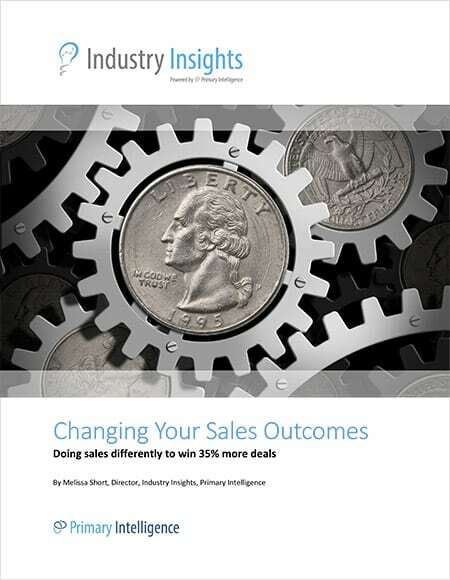 The company had recently implemented a Win Loss Analysis program with Primary Intelligence, and the feedback was coming directly from buyers as a major reason they were choosing the competition. The issue of pricing continued to bubble to the top during Primary Intelligence’s monthly transformation sessions before he took notice. “After getting knocked in the head three or four times with the deals that we lost, I realized it actually is price,” he said. Once Jim took notice, he resisted the urge to implement the obvious knee-jerk reaction: lowering the price. Instead, “I realized we needed to understand more about what clients meant by price,” he said. To really understand the issue, Jim and RoxAnne undertook a three-step process of discovery. RoxAnne continued to gather feedback from recently closed deals to better understand pricing. Recently closed deals were surveyed to gather quantitative feedback (the “numbers”) and then followed up with phone discussions to understand the reason for the numbers (the “why”). RoxAnne also worked with Jim to identify specific probing questions she could ask around pricing and value that would illuminate the issue. RoxAnne hosted discovery sessions for every buyer interview with the internal cloud computing division team responsible for the deal. During the sessions, she outlined the core reasons the buyer did or did not purchase from the company, and then worked with the team to identify the root causes. “It is important to ask the simple question of, 'What happened to cause x?' on the discovery calls and get to the specifics,” RoxAnne said. Meanwhile, Jim continued to dig deeper. He met frequently with his product team to dissect the problem, and worked on his own to look for patterns. During the sessions, Ken facilitated conversations with Jim and the other senior leaders to further provide the insights the company needed to take action. The lightbulb moment came when Jim reduced the problem down to a simple analogy. “I realized it was the BMW problem," he said. "One size doesn’t fit all, but we had one solution for all applications. It’s kind of like we have a BMW 7 Series and the starting price is $85,000. It’s a darn good car. The people who want the BMW, they love it, and they want all the things we can put on it. We were not losing on price with those people who needed enterprise solutions. Jim realized he needed to offer alternate solutions for clients without enterprise solution needs. More specifically, he needed to align the solution’s configuration with the application. For mission critical applications, the existing solution would continue to be the best bet. For non-mission critical applications, however, the company could offer lighter configurations better suited to the job. Jim and his product team designed and rolled out six additional configuration options for lighter cloud computing solutions. The new configurations were pre-priced and pre-packaged, offering greater transparency to the customer. For a lighter workload--those non-mission critical applications--the price was less expensive. “We didn't have to lower our price at all." While the change is still early on, Jim is already seeing benefits from the shift. Specifically, internal and external feedback is pointing to three primary outcomes from the new product suite. Jim expects benefits like a shorter sales cycle and higher sales satisfaction because the new portfolio is easier to sell and package for clients (often called “solutioning”). “According to Gartner, no one in the industry is doing this today. No one,” he said. Most importantly, the solutions are now priced competitively, allowing buyers to focus on the value of their data centers and industry knowledge. “The client has the ability to quickly consume this configuration because the solution has already been tested, so they don’t need to go through a proof of concept. It’s also very transparent. Our clients can see our pricing right up front,” Jim said. "Gartner said it’s a competitive advantage that we'll have for two years, so we’ve got to run with this really hard."